Last Friday, Mme. Annie and her lovely grade 4/5 class were in the library learning about nonfiction books and reading strategies. While comparing nonfiction and fiction text features and structures, we discussed hybrid books: nonfiction narrative or information storybooks. 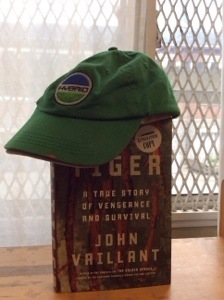 Several students pointed out Vaillant’s The Tiger on my shelf. Many students had heard about it from their parents, and it is one of my favourite books, and so we had a fun discussion about it. After we went to preview some nonfiction books, Emma, one of the students and a special library monitor, came up to me and showed me her hat, saying the book should have this hat. And so it should!